Prime Minister Thongloun Sisoulith on Tuesday praised the country’s planning, investment and finance sectors and urged everyone to keep up their good performance. The conference will review the implementation of the 2018 Annual Plan of Action and Finance and the 2019 plan for 2019 held at the Congress Hall Chaired by Mr. Somdy Duangdo, Deputy Prime Minister, Ministry of Finance, Deputy Prime Minister, Deputy Governor, Provincial Deputy Governor, Central and Local Finance participate. The government has approved a special budget of 500 billion kip (US$58 million) to repair public infrastructure that was damaged in last year’s floods, indicating that the remaining recovery work could soon begin. Prime Minister Nguyen Xuan Phuc lauded the diverse and intensive cooperation between the State Bank of Vietnam (SBV) and the Bank of the Lao PRD (BOL) in recent years while receiving BOL Governor Sonexay Sitphaxay in Hanoi on January 9. “We have a great opportunity to work with the government and the people in the country,” he said. “We have been working closely with the government and the people,” he said. Invited and involved parties. The batch of 30 T-34 medium tanks purchased from Laos arrived in Russia in early January. The government is still waiting for Vientiane’s Terms of Reference (ToR) to proceed with the delivery of a joint letter requesting that the French government supply maps and other related documents to settle a border dispute with Laos, Ministry of Foreign Affairs and International Cooperation spokesman, Ket Sophann said. Vice Chairwoman of the Vietnamese National Assembly (NA) Tòng Th? Phóng received President of the State Audit Organisation (SAO) of Laos Viengthong Siphandone in Hà N?i yesterday. 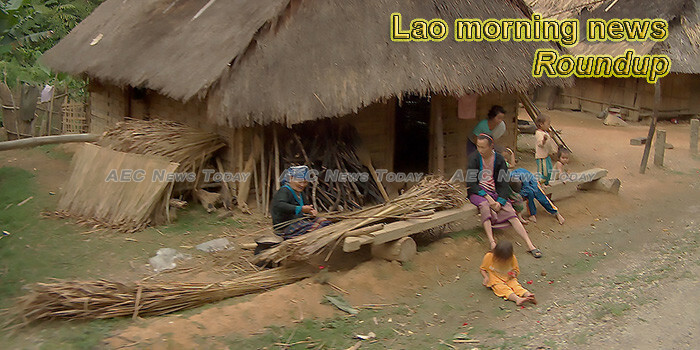 Earlier this week, Lao announced a year-long plan to draw more Chinese tourists to the country through its Visit Laos-China Year 2019. The campaign is expected to be launched either late January, or during the Chinese New Year week-long holiday between 2 to 9 February. Parliament’s endorsement appointed Minister of the Ministry of Defense security the new targets will be stringent in blocking forces antagonist bad. Luang Prabang, Xayaboury, Xiengkhuang and Houaphanh completed the meeting of the 7 th Party Central Committee Secretariat after two days (January 7-8, 2019) at the National Military Command Headquarters in Luang Prabang, under the chairmanship of Mr. Bong Thongmithy, Director of the Political Bureau of the Communist Party Central Committee, Secretary of the Party Central Committee, Deputy Prime Minister and Chairman of the Central Inspection Committee President of the Government Inspectorate and Head of the Central Anti-Corruption Commission, has a number of provincial and district deputy governors, vice-governors of the province, provincial board of management, and central management officials from four participating provinces. Construction of a new hospital in Huaphan province to further cement the brotherly relations between Laos and Vietnam is now 25 percent complete. Flash flood damaged houses and farmlands in villages of Bounneua district and Phongsaly district of Phongsaly Province on Jan 8. Yet initial assessments by local authorities suggest that the damages were trivial. The Ministry of Defense held a ceremony to kick off the second round of sporting events to mark the 70th anniversary of the founding of the Lao People’s Army (January 20, 1949-201, 2019) on January 8, at the National University Stadium, with the participation of General Secretary of the Royal Thai Defense Force.